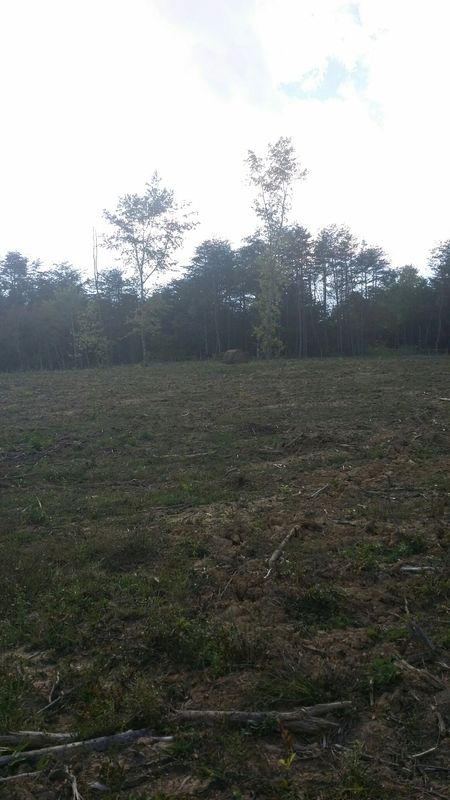 Ted moved Beef and Bessie last night into the paddock (which now opens into the huge new fenced three acres). This morning, Bessie acted “off”. She didn’t eat much, and she seemed restless. Gramma said she was sure today would be birthing day. We checked on her many times today; about eleven this morning, she had some thick mucus on her backside. I sent Ted for a new bale of hay over at Ronnie’s in case we had to separate Beef from Bessie. Ted also wired off the cattle shed because it was just mucky, and I didn’t want her giving birth in that. 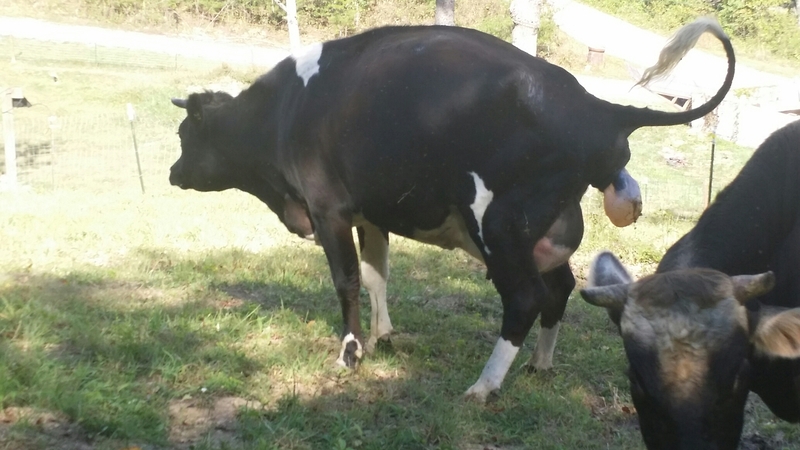 About 3:30, Gramma called and said something was protruding from Bessie, but she couldn’t quite see what it was. We flew to the field, and I flew up and around the pond, through briars and weeds just so I could get a better view. FEET!!! THERE WERE LITTLE TINY FEET HANGING OUT!!! I was so excited, and I was super relieved that they were the front feet (facing down and bent toward the ground). Beef kept sniffing around Bessie and wouldn’t leave her alone. He even tried to mount her like he thought she was in heat at one point! 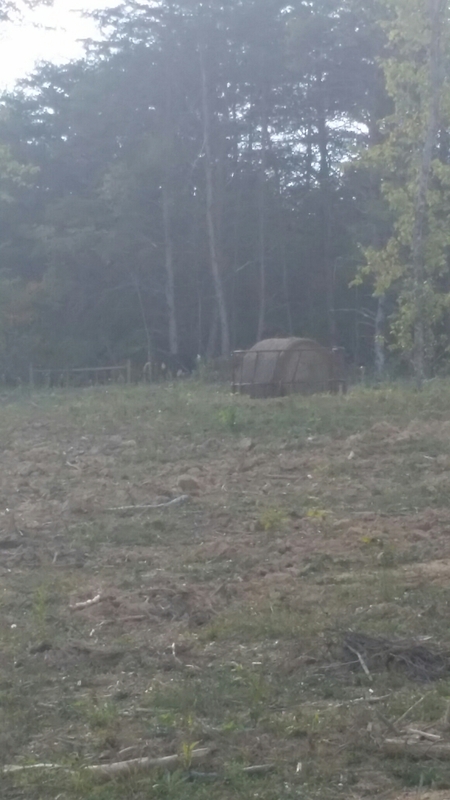 She got aggravated and started down the hill toward the big acres. That was when we decided to separate the two of them. 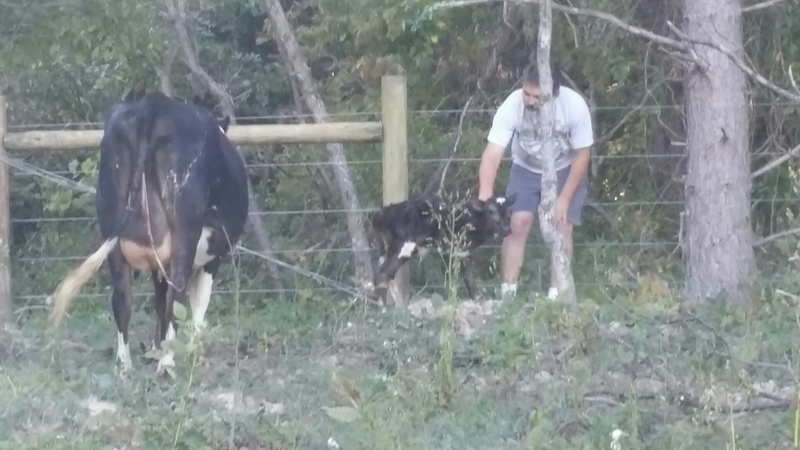 Beef followed us into the paddock, and I kept him occupied by shaking my glass of ice at him (he’s so curious about anything g new), and Ted slipped under the fence and hung electric wire across the open area (where we were going to hang a gate this weekend in prep for the baby coming!). Bessie went all the way across the new field to the very top. It was clear she didn’t want bothered. Ted went into the field about halfway to keep an eye on her. At this point, it had been about an hour. That’s when I started to get a little freaked out. My reading had led me to believe that it was 15 minutes from feet to head appearance and then another 15 from head to shoulders and then another 15 from shoulders to out. It had been an hour, and there were still just two tiny feet coming out a few inches with each push (which were coming every five minutes) and then retracting in a little bit. I started to think the head was stuck and possibly bent looking upward. 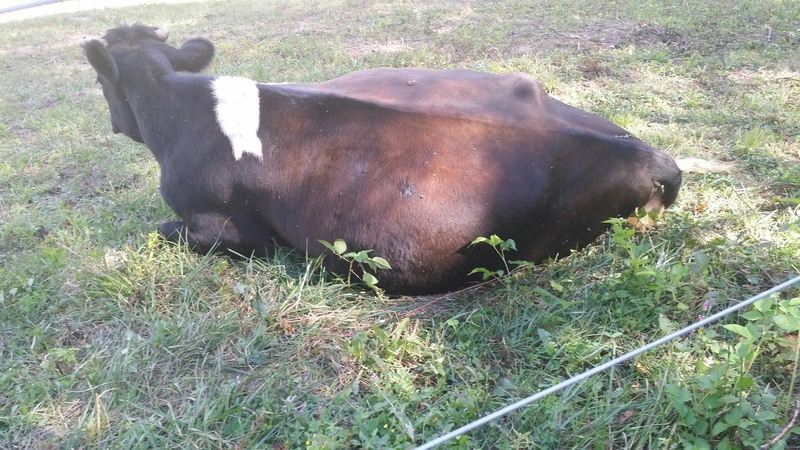 A downed cow is not good. It can be life threatening. It can mean all kinds of bad things. We started moving closer to her quickly, and I could see her head was up and her tail was swishing. 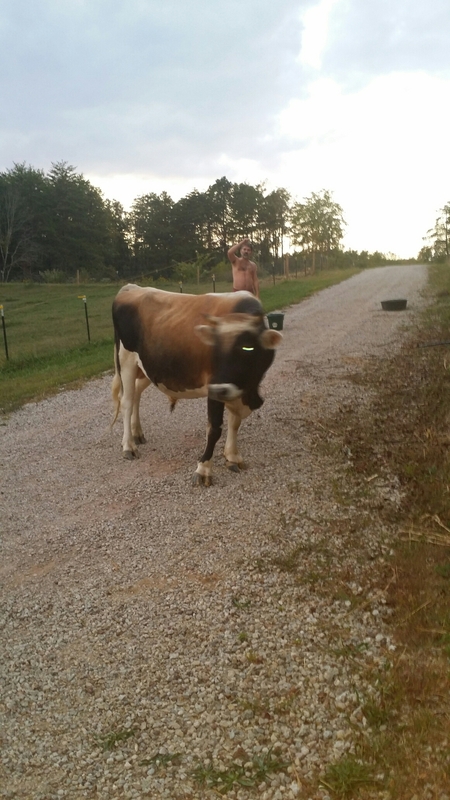 She was doing normal Bessie cow stuff so we stopped, giving her space. And then she strained, and I caught a glimpse of a bulging something. I told Ted that I thought she’d had the calf, but he didn’t believe it could be that fast. When we got closer, he went up one side of the fence as I am led closer up to the top of the hill. We didn’t want to scare her or make her feel like she needed to move again. She wanted privacy and had made that abundantly clear so we were trying to be respectful. It was so hard. I wanted to be sitting right beside her!!! Then he whispered to me, “Something is moving! The head is out!” It was. 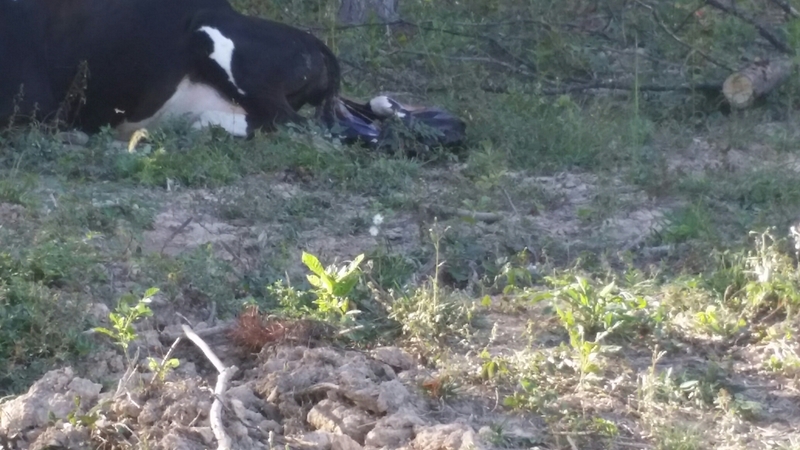 The calf ‘ s head was out, not covered by the sack, and it was moving around!!! It was breathing! Another push, and it slid out completely onto the ground. Bessie seemed confused. She just wasn’t sure what this little thing was. She sniffed and sniffed it, turned her head away several times, and looked at it again and again. The calf was trying to move around, and when it rolled a little, she moved around and stood up, and she started to lick it. Then the best thing ever happened: she made her Mommy Moo. 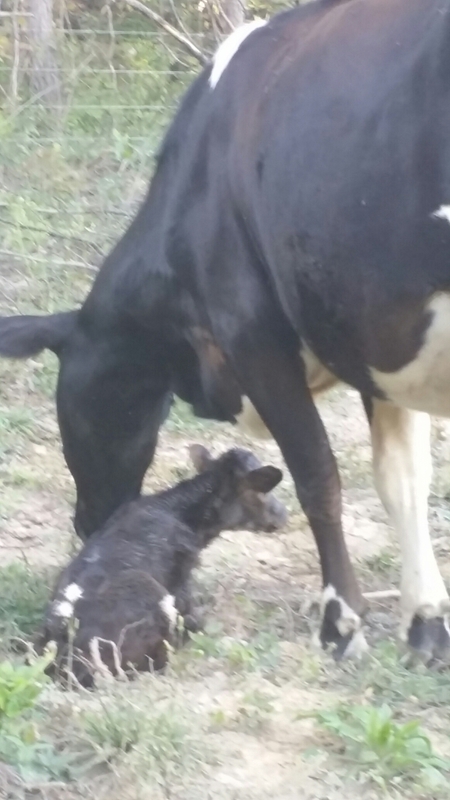 The Mommy Moo is a special moo that you never hear before your cow has a calf. 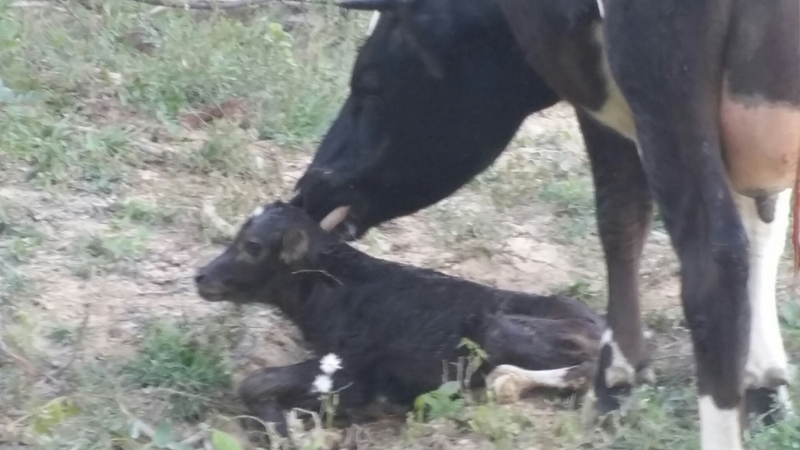 It’s a little cooing low moo at the calf, and she will only make that sound for her own calf. It was so special to be there and hear it. 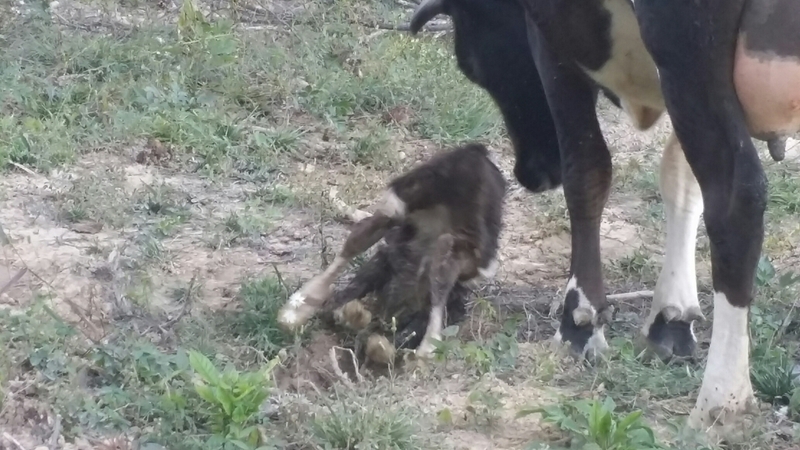 After almost an hour, the calf tried standing up. It was so wobbly, and it kept falling down. Ted drove Gramma and Sahara up the hill to see the calf. 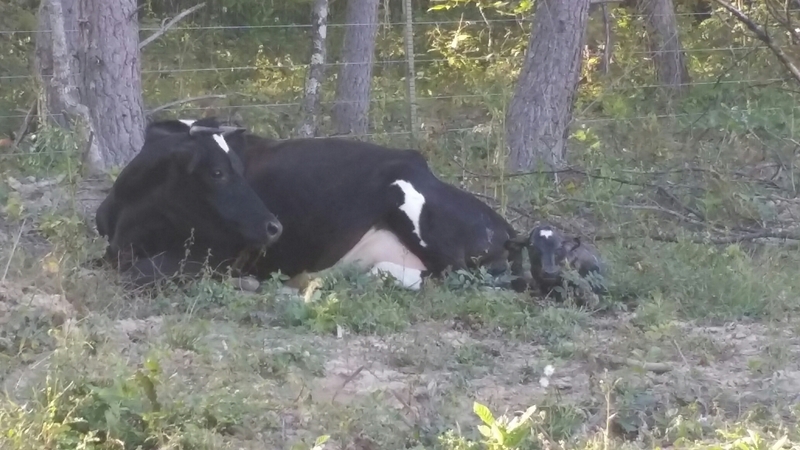 Bessie was alert and kept her eyes on both of them. She didn’t mind Ted or me being close to her though. Eventually, Ted got close enough to pet the calf and Bessie. We were still trying to be very cautious because as a first time mom, we weren’t sure what she might do if we got near her calf. She was as gentle with it and us as could be though. Ted and Teddy walked back up and fed her a big pan of sweet feed, and the calf was up and nursing! 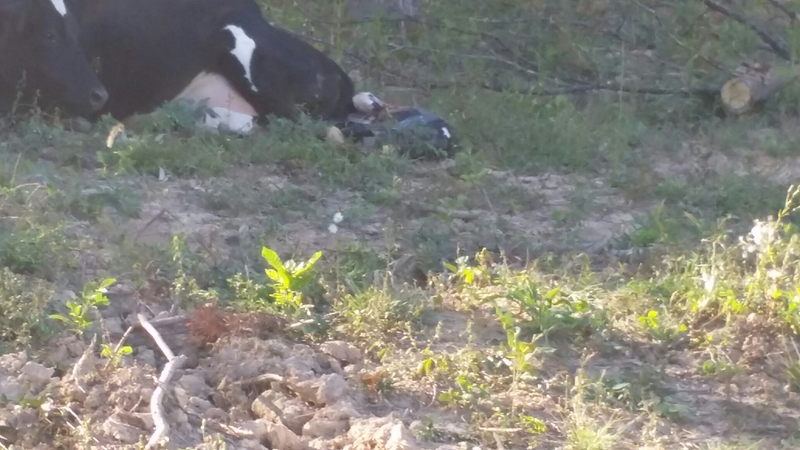 The milk letdown was huge, and all of her teats were streaming colostrum out while the calf nursed. After we ate dinner at Gramma’s (biscuits and gravy – yum! ), Ted and I took a big bale of hay back up and spread it all around Bessie and the calf. Bessie passed the complete afterbirth and ate it (funniest thing ever was when this happened and Ted said he was going to puke – he really meant it, and he couldn’t even look at Bessie as she ate it). 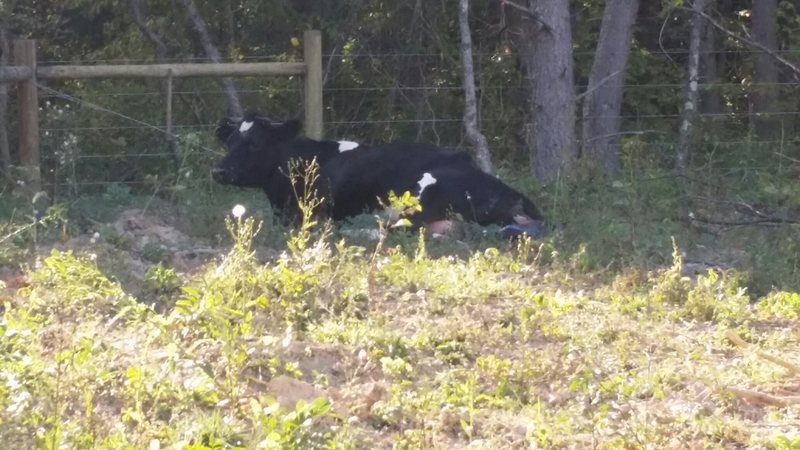 I was able to pet Bessie and the calf, and then I did a good check to see if Bessie had a girl or a boy. 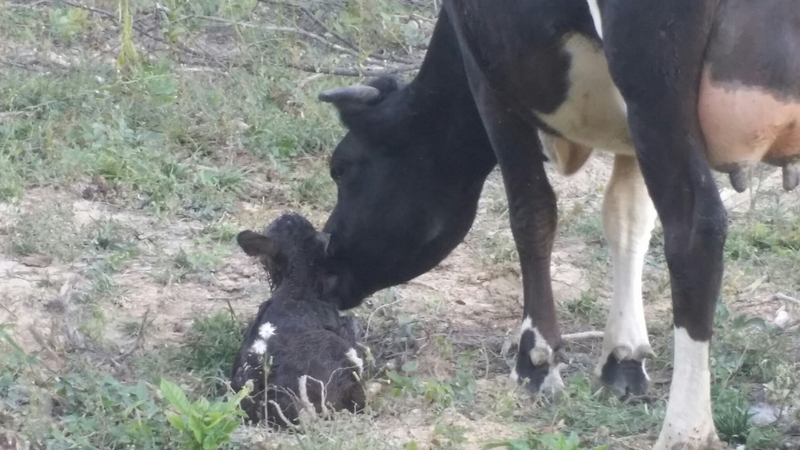 Congrats on the heifer – what great news!